Presidio County commissioners discuss embattled precinct 3 commissioner Lorenzo Hernandez at a meeting in July. The Presidio County Commissioner’s Court Tuesday took action on several items related to embattled Precinct 3 Commissioner Lorenzo Hernandez. Nearly two weeks ago, Hernandez was arrested on federal bribery related charges. 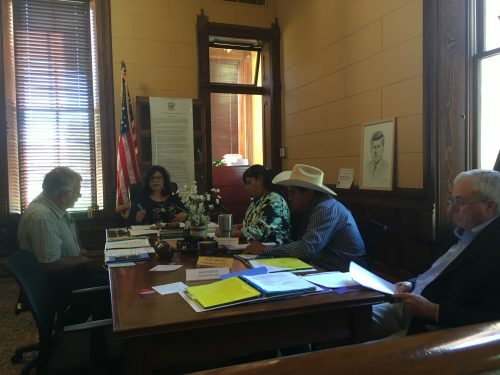 Inside a tightly packed room, Presidio County judge Cinderela Guevara addressed her fellow commissioners, sitting under a laminated copy of the Presidio County code of ethics. The topic: Precinct 3 County Commissioner Lorenzo Hernandez, who, nearly two weeks ago was arrested on federal bribery related charges. “I’m asking for permission for you to authorize me to write Lorenzo Hernandez a letter to either resign voluntarily or to go ahead and take a temporary leave of absence,” Guevara said. County Commissioners are unable to remove Hernandez from office, according to Texas code. They must ask Hernandez to resign or to voluntarily take a leave from his position with the commissioners court until his federal charges are resolved. As Guevara addressed the commissioners, she read aloud from the letter she intends to send Hernandez. If Hernandez declines to resign, or temporarily step down, the commissioners court is ready to respond. On Tuesday commissioners also authorized county attorney Rod Ponton to file a removal petition with the district court. This would temporarily suspend Hernandez’s role with the commissioner’s court, and allow the county to find a temporary replacement. Commissioners also voted to remove Hernandez from the Presidio International Port Authority Board. Hernandez — along with Presidio official Carlos Nieto — is accused of defrauding the city and receiving kickbacks in order to secure a city contract with a computer software company, S&K Computer Works. That company, however, was a ruse set up by the FBI. For two years, agents investigated the Hernandez and Nieto. Hernandez allegedly received more than $19,000 (and Nieto $8,300 dollars) for their reported role in securing the county contract. During their regular meeting on Tuesday, the commissioners also took effort to discuss their May 9th meeting when the group voted 3-1 to approve the S&K Computer Works contract. The commissioners noted the approval of the contract was contingent upon several factors, including a final budget approval and recommendations. Precinct 1 commissioner Brenda Bentley expressed her hesitation at the May 9th meeting, saying there was little information on the company. The court also discussed and updated the county’s conflict of interest policy to be in accordance with state code. Last week at a special city council meeting, council members voted unanimously to abolish the position Carlos Nieto held, effectively ending his employment. This entry was posted in KRTS News, KXWT News and tagged commissioners court, Presidio County. Bookmark the permalink.